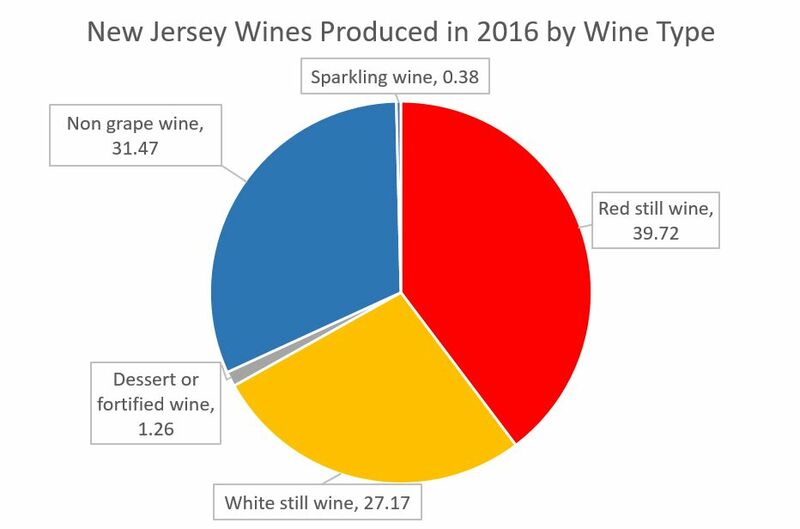 In our survey of the New Jersey wine industry, of the 2016 vintage, five grape varieties are leading production in the state – Chambourcin, Cabernet franc, Cabernet sauvignon, Merlot, and Chardonnay – each with more than a dozen producers. Rounding out the top 15 most widely grown varieties are Syrah, Petite verdot, Viognier, Albariño, Blaufränkisch, Vidal blanc, Traminette, Pinot grigio, and Riesling. Many other varieties are being produced by a few commercial growers, 58 in total. Production is growing as revealed by the fact that of the total wine grape acres reported 24% are non-bearing, meaning that they have been planted recently. The 24% comprise new plantings and replanting of older vineyards, both indicative of a strong and growing industry. Wine production is diverse with the largest quantity of wine produced being in the category Red still (not sparkling) wine. Significant quantities of Non-grape wine (made from other fruits), and White still wines were also produced as well as smaller quantities of Dessert or fortified wine and Sparkling wine (see figure below). The New Jersey wine industry is diverse and growing. Each year brings new grapes, wines, and vintages worth celebrating. If the past few decades are indicative of a pattern, then there is a promising future ahead for New Jersey wine.